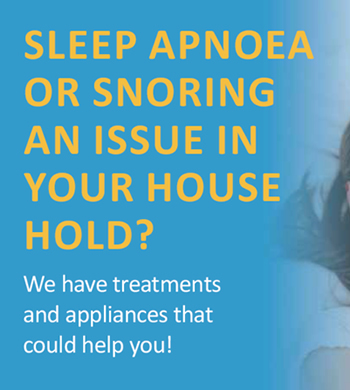 Is Your Snoring Caused by Sleep Apnoea? What is sleep apnoea? “Apnoea” literally means “stopping breathing”. If someone suff ers from sleep apnoea, they can stop breathing several times during the night. In severe cases, these episodes can be as frequent as 80 times per hour. If you or someone in your family snores during their sleep, it may be a symptom of something more sinister – sleep apnoea. Since 70 per cent of excessive snorers do have this condition, it is an important issue warranting further investigation. After all, sleep apnoea is a serious medical condition which puts you at increased risk for strokes, heart problems, diabetes, high blood pressure, and accidents. At Michelson’s Dental Surgery, we want to make it our daily mission to help our patients to receive the best care possible and to invest in dentistry that not only improves their dental health, but also overall quality and satisfaction in life. 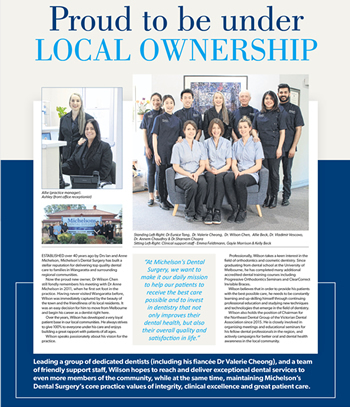 Leading a group of dedicated dentists (including his fiancee Dr Valerie Cheong), and a team of friendly support staff, Wilson hopes to reach and deliver exceptional dental services to even more members of the community, while at the same time, maintaining Michaelson’e Dental Surgery’s core practice values of integrity, clinical excellence and great patient care.